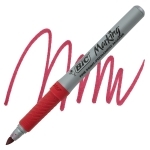 Hard-to-mark surfaces are no match for Marking Color Collection markers from Bic. The fade-resistant, acid-free ink comes in a variety of expressive colors, and is permanent on most surfaces. A rubber grip lends comfort and control. Bullet nib.